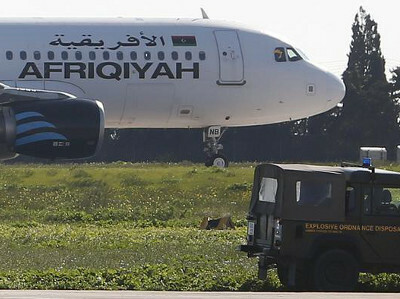 Civilian flights were suspended for several hours at the Libyan capital’s Mitiga airport on Monday and Tuesday as rival armed groups clashed nearby, a spokesman said. Sporadic shooting could be heard near Mitiga, a military air base near the centre of Tripoli that has also hosted civilian flights since the international airport was destroyed by fighting in 2014. The airport reopened by midday. “Flights were suspended but the airport is working normally now,” said Mitiga spokesman Khaled Abukhrais. Clashes began when the Special Deterrence Force (Rada), a group that controls Mitiga and operates as an anti-crime unit aligned with the UN-backed government, conducted raids in the Gharat neighbourhood. Rada spokesman Ahmed Bin Salem said the group targeted tried to attack the airport area after a “wanted drug dealer” was killed when he fired on a Rada patrol. “Ghrarat is now under the control of our forces and it’s being treated as military zone so we can clear any resistance,” Bin Salem said. One member of Rada was killed and two wounded and there were several casualties among their opponents, he said. Tripoli is controlled by various armed groups that have built local power bases since Libya’s 2011 revolution. There have been fewer heavy confrontations in the capital since groups linked to a previous, self-declared government were pushed out of the city earlier this year, but armed skirmishes, kidnapping and other criminal activities are still common.